Approaching main house with harbor view to the right. We have over 200+ feet of private, sandy beach. Large, beautiful, and comfortable living room. 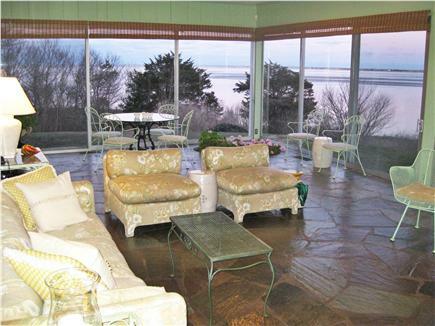 Large, wall-to-wall glass enclosed sunroom with water views. 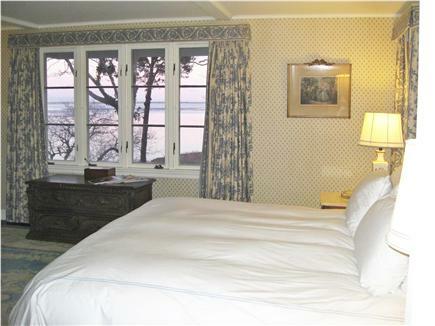 Master bedroom has views of harbor and ocean . Another luxuriously decorated master bedroom. Outdoor dining terrace with views of harbor and Atlantic. Cottage with two bedrooms and two baths. 50' from main house. 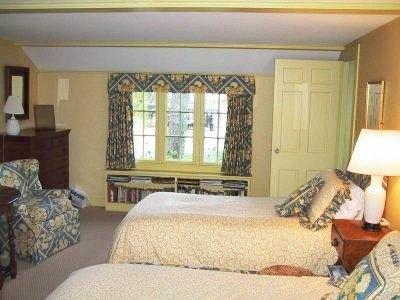 Beautifully decorated and comfortable cottage bedroom. 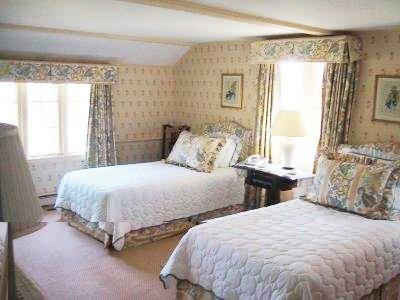 Another well appointed cottage bedroom. 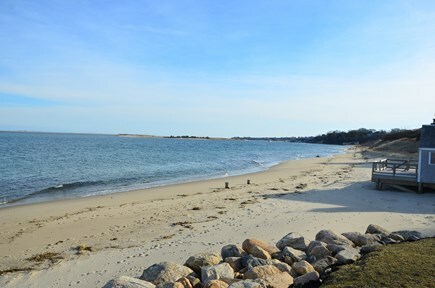 Our 200+ feet beach is part of 1 mile of beach on Chatham Harbor. 120 foot English bowling lawn suitable for other lawn sports. 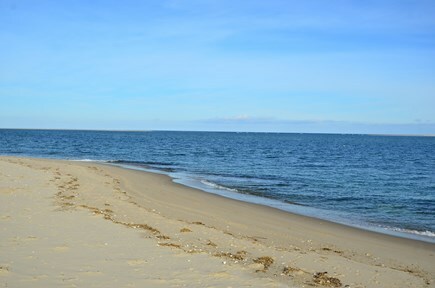 View of our private, sandy beach, Chatham Harbor, and Atlantic. Beach: Own/private beach 50' from main house. 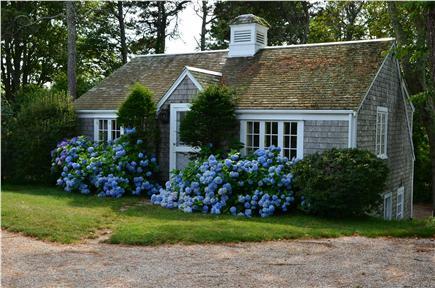 Charm and Old Cape tradition meet comfort and privacy in this well appointed home! 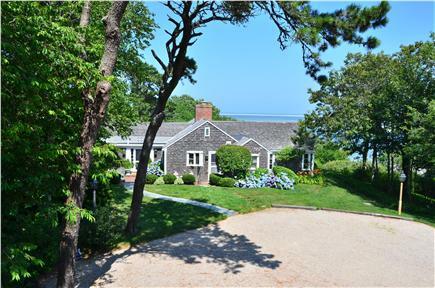 Drive up the 300' driveway, look out over Chatham Harbor and you know you have arrived at a very special place. 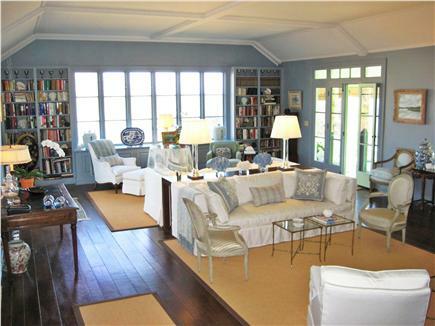 This 2+ acre estate has over 200 feet of its own private sandy beach. 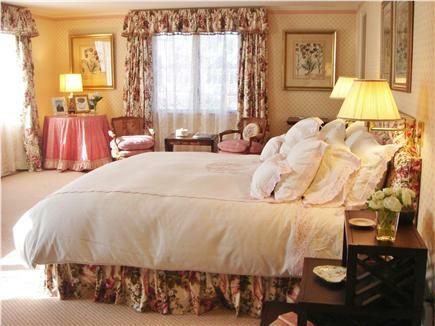 The main house and guest cottage are luxuriously decorated by a well-known New York designer. Large living room, dining room, outdoor dining terrace, and glass sunroom with spectacular views overlooking Chatham Harbor, North Beach, and the Atlantic. Sunroom has a wet bar and 50'' TV - great for family gatherings. All 6 bedrooms have their own private bath. The 2 bedrooms in the north wing have central A/C; the south master bedroom and cottage have wall A/C units. Accommodates 12 in 6 bedrooms. Fishing, sailing, boating, kayaking and scenic views await you. Truly an exceptional home in which to enjoy your family vacation. 120' x 25' English Bowling lawn suitable for bocce, volleyball, croquet, and other lawn sports. 15 min walk to Chatham village. Secluded area: great for walking, running and biking. Mooring available. Wireless internet. 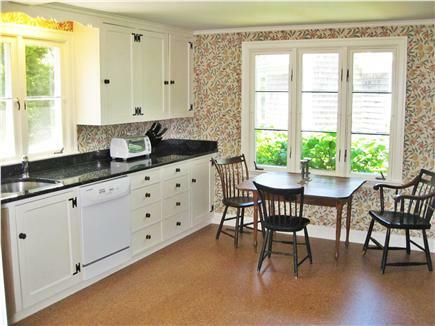 As of June 2009 the kitchen has been beautifully renovated with new blue/green granite countertops, cork tile floor, William Morris wallpaper, Fisher & Paykel stainless steel refrigerator, and more. Security deposit and cleaning fee required. Nearest beach: Own/private beach 50' from main house. Additional pricing info: There is an end of week cleaninfg fee of $595 and a security deposit of $1,500. State and local taxes of 12.45% will apply. Thank you for allowing us to use your beautiful home for our vacation. We had a wonderful time and it suited our needs perfectly. It was so great to be able to have our whole family in one spot. . . . . I want to thank you and your wife again for renting us your beautiful home for our vacation. I just love Chatham, and we had a wonderful time there. . . . . Our family had a glorious week at your house. It was plenty big enough for all 12 of our family with nice roomy bedrooms We could spread out on the patio for cocktails, play games at the glass table on the sun porch and hold the family olympics on the bowling green. The kitchen was well supplied with everything we needed for "cooking in", including the big lobster pots. Thank you so much for letting us use your beach towels. We really needed them since we had perfect beaching weather and had neglected bringing ours from home. The big dining room table was able to accommodate 15 of us when our nephew and family came for dinner one night. All in all we had a wonderful time and appreciated being able to use your beautiful house for our 50th anniversary celebration. Your home is fabulous. It is a little bit of paradise. The light from the setting sun is beyond description. The house exceeded our expectations as we thought that the website photograghs, while quite nice, did not really do justice to the house and property . . . Our grandchildren loved your beach -- especially all the shells and sea life.